To look at Aotearoa Warriors loss to Wests Tigers in the NRL last week in isolation, doesn't do justice to what a nightmare the excursion to Sydney was for the entire club. The Canterbury Cup team lost 48-10 to Western Suburbs Magpies, while the Jersey Flegg lads at least had a 28-28 draw to salvage a slither of pride. The weird thing here - perhaps pointing to a some type of makutu (curse) placed on the Warriors last weekend - is that all three Warriors teams had completion rate percentages in the 60's. The NRL team completed at 67 percent, reserve grade was horrible at 63 percent and Jersey Flegg had 66 percent. Such a blatant trend across the whole club, should ease any concerns about the NRL team's performance and we could lean into a few different angles as to why this happened. I don't really care why though and the only really issue could be in that this was the first away trip for the club, so hopefully this doesn't point to how away trips are going to pan out in 2019. Horrible weekend of footy for the club, yet this is a new round and we keep things chugging on forward. There was no Taane Milne or Adam Pompey for the reserve graders last week, with Paulos Latu coming in at centre and Setu Tu on the wing. Tahi Baggely and Phillip Makatoa came into the squad, with Makatoa being the bloke from the Flegg squad who is getting the most opportunities in reserve grade. Makatoa was initially named in Flegg team and is again named to start at prop for the Flegg team this week vs Manly Sea Eagles. Wings: Edward Kosi, Setu Tu. Centres: Cole Waaka, Adam Pompey. Halves: Hayze Perham, Chanel Harris Tavita. Middles: Chris Satae, Clayton Williams, Ligi Sao. Edges: Blake Ayshford, Leivaha Pulu. Bench: Sam Cook, Paulos Latu, Preston Riki, Tom Ale - Tahi Baggaley. At the time of writing this, I don't know who has replaced Sam Lisone in the NRL team. This may not have an impact on the lower grades as the NRL team plays on Saturday and the lower grades are in Sydney on Sunday, so someone like Ligi Sao may be able to jam NRL on Saturday and then Canterbury Cup on Sunday. That's possible, but if Sao (or whoever) is absent for Canterbury Cup, the most likely option is to then bring Makatoa into Canterbury Cup again as he's the middle forward moving between the two grades. Christchurch's Tahi Baggaley has been named as 18th man for the reserve grade team, but his 27 minutes last week came at centre and unless Baggaley is still called into the game day team as general cover, I suspect it'll be Makatoa coming in. Cole Waaka is the major inclusion for the reserves, with Milne still out of action. Wings: Emanuel Tuimavave-Gerrard, Harley Maynard. Centres: Patrick Elia, Ray Tuaimalo-Vaega. Halves: Sione Moala, Casey Smith. Middles: Wesley Veikoso, Phillip Makatoa, Tyler Slade. Edges: Brody Tamarua, Isaiah Vagana. Bench: Caleb Pese, Jyris Glamuzina, Temple Kalepo, Junior Pua - William Fakatoumafi. The Warriors website says that Emanuel Tuimavave-Gerrard is returning from injury on the wing, perhaps putting him and Harley Maynard ahead of Selestino Ravtaumada as the wing depth right now; Tuimavave-Gerrard replaces Ravutaumada. Youngster (he was NZ Under 16s Player of the Year last year) Sione Moala came in as a late inclusion for Paul Turner and is starting alongside Casey Smith again this week. 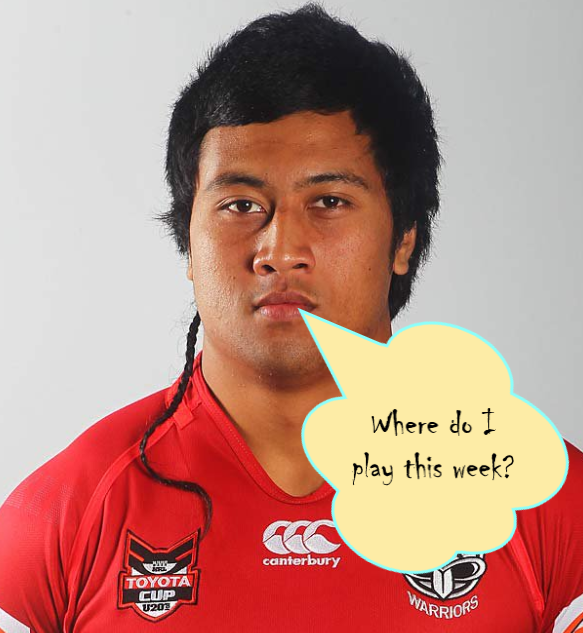 Junior Pua started in Makatoa's place last week and is back on the bench with Makatoa named to start.